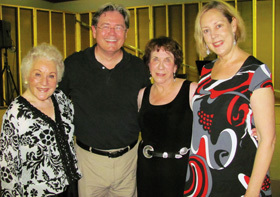 Courtesy Rick Allen Lippert(Left to right) Donna Mackie (Betty), playwright Rick Allen Lippert, Laurel Van Horn Jaworsky (Bobbi) and Billie Nash (Amanda) pose for a picture Aug. 19 at the Carpenter Square Theatre. “Best in Ten,” held Aug. 19 at the Carpenter Square Theatre in downtown Oklahoma City, was attended by OCCC professor Rick Allen Lippert whose play “Bettie’s and Bobbie’s Birthday” was one of those chosen to be shown. Rhonda Clark, the theater’s artistic director, asked Lippert to submit his work. “This event is held as a fundraiser for the theater and the plays act as the entertainment for the night,” Clark said. The night consisted of presentations of the winning plays from the 10- minute play festival plus some already published 10- minute plays. Clark said they had fewer than expected entries. Lippert, an OCCC journalism, broadcasting and theater adjunct professor, said he was honored to be part of the event. He said in years past he has entered plays for consideration and he has “been blessed” to be accepted almost every year. Lippert said, he writes dramas and comedies. Lippert said after he was told Laurel Van Horn and Donen Mackie would be recognized for their support of the theater, he decided to write a play that would allow them to be in the spotlight. Van Horn is a former theater board member and a “strong supporter of the theater since its first season in 1984,” Clark said. Van Horn and Mackie performed Lippert’s play, which Lippert said, is about estranged sisters who share the same birthday and ex-husband. Proceeds from the event helped support the theater’s building fund, as well as programming for its 28th season, which includes eight productions and educational outreach to at-risk students in the metro area. After the June 2010 flooding in Oklahoma City, the theater had to temporarily relocate while the original theater is repaired from the flood damages, Clark said. “We were really fortunate. We found an opportunity at the Bricktown Hotel and Convention Center, and we performed our entire 27th season there,” Clark said. The theater hosts student matinees for area at-risk high school and middle school students, and they also do workshops with them that are held in the spring.